When I turned nine years old, I started dreaming about who and what I wanted to be when I grew up. Predictably, those dreams included the usual “nine year old boy” suspects: firefighter, astronaut, karate kid, power ranger, etc. Long before I turned nine years old, my mother had a single dream in mind for me, her first-born son: to become a physician. My mom, who now has her doctorate in nursing & serves as a nurse practitioner, was not shy in expressing her desire to me. It was so strong that when I enrolled in my first semester of college at the age of 17, she signed me up (against my will) for Anatomy & Physiology class. So for the first 5 weeks of my freshman year, I was the only history major taking Anatomy & Physiology…as an elective. Luckily, my dad assisted me in dropping the class – thank you dad. This was her last ditch effort at me “seeing if I liked it….you’ll never know until you try.” I tried…and I did not like it. Shortly after I turned nine in November of 1996, my mother planted the first seed in her attempt at cultivating a love for medicine in my heart. She purchased a copy of Gifted Hands, by Dr. Ben Carson which would become required reading for me in the summers to come. She began reading to me about this Seventh-Day Adventist who had become the director of pediatric neurosurgery at Johns Hopkins University Hospital at the age of 33. A year later, my father accepted a call to pastor in the DMV area and we would drive by the hospital in Baltimore often. Though that initial seed never grew into a love for the profession that made Dr. Carson so iconic in our church (and beyond), I developed a deep respect for who he was and what he represented. He became director of pediatric neurosurgery at Johns Hopkins University Hospital at age 33. He did this for 29 years. In 1987, he gained worldwide recognition for his part in the first successful separation of Siamese twins joined at the back of the head. In 1997, he conducted the first completely successful separation of type-2 vertical craniopagus twins in 1997 in South Africa. Dr. Carson holds more than 60 honorary doctorate degrees. He has published 8 books, 3 of which, including Gifted Hands (and this one), were New York Times Bestsellers. Cuba Gooding Jr. played Dr. Carson in a movie about his life. It was this true sense of character that caused everything that his gifted hands touched to turn to gold. This all begs a very important question: what is Dr. Carson doing now? How did he transform from the first 700 words of this blog into the political punch-line – a label beneath a man of his intelligence & acumen – that he has become today? What does his candidacy, or lack thereof, say about the SDA church and how we relate to some of these vitally current political issues that Dr. Carson seems to find himself on the wrong side of? I believe a brief analysis of where Dr. Carson is now can help shed some light on where we are as a church, and where we might need to go. Dr. Carson officially announced his presidential candidacy on May 4th, which prompted the SDA church to release a good, albeit predictable, statement on his presidential bid. Most people trace Dr. Carson’s meteoric rise to conservative political darling back to the controversial statements he made at the February 2013 National prayer breakfast. He made several statements that contradicted ones made by the man I met through Gifted Hands. In the speech, he criticized what he called the current “welfare state” in this country and insisted that the rich have always taken care of the poor and “no one is starving in America.” In Gifted Hands Dr. Carson talked about how his grades improved tremendously after a government program provided him with free eyeglasses as well as declaring that his mother would not have been able to provide for him and his siblings and keep up the house had it not been for food stamps. On his website, Dr. Carson outlines his stance on the issues that will be central to his campaign. He emphasizes keeping faith in our society, a balanced budget, keeping the Guantanamo Bay prison open, the ills of Obamacare, and an aggressive approach to the growing “Russia problem.” You can read more about his feelings on those issues on his website, however, you will not find many solutions offered. He provides a diagnosis, but does not offer any real plan to treat it. A man with his background should know that talking about whats wrong, in a vacuum, does nothing to make it right. Why is he doing all of this? As has been chronicled in several publications, non-politician candidates do not do well in Presidential elections. He has labeled himself as the anti-politician and is not a big fan of political correctness. On his most optimistic day, Dr. Carson would have to admit that success for his campaign (however he would define that) is a long shot at best….but what is it at it’s worst? The sad reality is what we have seen of Dr. Carson in the political arena up to this point is probably as “good” as it is going to get. After the dust settles, and it will, he and his supporters will be left to ask themselves how the last 2+ years will affect/define his legacy. His church will have to decide if it should chip away at his place on that Rushmore Mountain. “While individual church members are free to support or oppose any candidate for office as they see fit, it is crucial that the church as an institution remain neutral on all candidates for office. Care should be taken that the pulpit and all church property remain a neutral space when it comes to elections.Church employees must also exercise extreme care not to express views in their denominational capacity about any candidate for office, including Dr. Carson. On the surface, there is nothing wrong with this statement. The church as an institution, a non-profit one at that, has to be careful to not be used as a tool for any particular person’s political gain. This objectivity in regards to political association has kept us on the right side of that separation between church and state. My initial reaction to Dr. Carson’s new (at least new to me) political persuasions was that he definitely does not represent the views of the SDA church on most of the issues. As I began to unpack that in my head, I struggled to actually pinpoint why that is the case. My thought process went something like “I know that this guy doesn’t speak for me or my church…but…well what does my church actually have to say?” As has been the case with other hot button topics that have been discussed heavily in our church, there remains a void in our church’s institutional input on those issues. Dr. Carson has the potential to step into that void (perhaps he already has)…and if the church is not careful, it could allow the unintended consequence of having him speak for it. The SDA church is not a political party, and it obviously should not be aligned with any particular party that currently exists. At the same time, it amazes me that the church seems to say so little, as an institution, in regards to the issues that the world it operates and serves in is talking about. Equal pay for women, trade agreements that may affect the job status of it’s members, race relations in this country and the church, staying faithful to our biblical integrity while actively addressing the issue of gay marriage and it’s real world implications…the list goes on. This is not a call for a campaign, we can leave that to Carson and the countless others who will be working for votes in 2016. This is a plea for an identity. A core set of values that do not just apply in the spiritual context, but one that can inform our thinking in other areas of life and prompt us to look for opportunities to apply those values to issues that matter to the world we are trying to save. This is the perfect opportunity for the NAD, or even our church’s General Conference to release a statement clarifying and re-iterating it’s commitment to religious liberty for people of all religions and faith…especially the religious liberty of a professor at our largest, most popular educational institution. We cannot just advocate for these issues when there is something to gain for us, or when there is an opportunity to look good. A true commitment to the issues is about establishing an identity and sticking by it. When that identity is challenged or questioned, as it has been by this incident at my alma mater, our church has to stand up for what it claims to stand for. If we don’t, then the church’s value system is just as faulty as it seems the value system of one of it’s most prominent members has become. What a great blog post! It is truly sad that Dr. Carson has forgotten where he came from and has bought into the political rhetoric being spewed by so many that obviously harness hatred and disdain for those with less than them. I applaud you and your words. God Bless! Thank you so much for your comment! God bless you as well. Well written Michael! I’ve been quite interested in what Dr. Carson will use as his platform in running for presidency. It will be interesting to see what changes he will make in his platform as he moves forward, my hope and prayer is he spends more time in scripture and in prayer then he does in speech writing. Thank you for sharing Joe! I definitely agree that he needs to spend some time honing his messaging skills. He has to be about more than just shock value. can learn how to avoid such disappointing end to what was so promising a start. Thank you for the feedback! Well said. Thank you Michael, very well written and said. I especially will chew on the sections about the church speaking up on issues or else Dr. Carson will become the church’s voice on them by default. I applaud your observation and agree but also caution that sometimes institutional statements on issues may also handcuff us when it comes to treating individuals’ cases, as with your perfect example of the professor at Andrews. While I think the university has failed to apply properly a fundamental religious liberty principle, in most cases a blanket application of a principle for a world church usually ends up stifling a hopeful Spirit led application in another context, be it cultural, geographical, or chronological. That we Adventists once held onto a timeless principle of being non credal, our institutional attempts at unity have made that much more difficult to attain and live out in how we treat our family members – family being all in our church, schools, hospitals, and businesses. Thank you for your voice, Michael. Thank you for your feedback! Great insight. Bro, beautifully written piece, I couldn’t resonate more with your points. I too read that book as a kid and was proud that he was an SDA and lived right down the street. Since 2013 it’s been a different story. I’m afraid that his candidacy will only cause me to feel further misrepresented in my Adventism than I already feel I am. Dr. Carson unfortunately will be the foremost SDA voice in people’s ears while spewing rhetoric that I couldn’t find more difficult to swallow. I pray for a swift and quiet death to his campaign. Bro, beautifully written piece, I couldn’t resonate more with your points. I too read that book as a kid and was proud that such an inspiring and accomplished individual was an SDA and lived right down the street. Since 2013 it’s been a different story. I’m afraid that his candidacy will only cause me to feel further misrepresented in my Adventism than I already feel I am. Dr. Carson unfortunately will be the foremost SDA voice in people’s ears while spewing rhetoric that I couldn’t find more difficult to swallow. I pray for a swift and quiet death to his campaign. Bro, beautifully written piece, I couldn’t resonate more with your points. I too read that book as a kid and was proud that such an accomplished individual was an SDA and lived right down the street. Since 2013 it’s been a different story. I’m afraid that his candidacy will only cause me to feel further misrepresented in my Adventism than I already feel I am. Dr. Carson unfortunately will be the foremost SDA voice in people’s ears while spewing rhetoric that I couldn’t find more difficult to swallow. I pray for a swift and quiet death to his campaign. Thank you bro!! I too hope that this somehow goes away without fanfare. Just a quick comment on the religious Liberty for the teacher at Andrews. I have not read it, so this may have already been said. I teach at one of our institutions and my contract does put membership in the SDA church as a requirement for employment. Interesting article. I hope Ben does read it. Thanks for the comment! I would encourage you to read the Spectrum article on the incident. I know that some SDA institutions require church membership, but AU does not (they have other non-Sda faculty/staff). It is obviously encouraged, but not required. Very well written. I too used to look up to Dr. Carson…it’s almost unbelievable that this is who he was all this time. Truth be told, I’m not sure if he truly knows who he is…his true identity. But I’m not here to judge him, as I’m sure you’re not either – it’s a sad observation. But I do see an unfortunate opportunity in the wake of all this – his commentary becoming the “unofficial” stance of the SDA church, largely because (as you stated) we don’t have one already on these huge current issues. Keep up the excellent commentary Mike…it may very well be needed in the soon future. I agree our church is not a political party and should not be aligned with any particular party that currently exists. However, equal pay, trade agreements, and race relations have been political topics for over 25 years (Bush/Bush, Clinton/Clinton, Bush/Bush, Obama/Obama). A formal statement addressing these issues during the time frame would have undoubtedly led to political conversation citing party endorsement concerns as well as arguments regarding church and state; thus making the current the statement a contradiction. When it comes to staying faithful to our biblical integrity while actively addressing the issue of gay marriage and it’s real world implications, preaching straight truth in the pulpit, in our conversations, living straight truth in our lives would send a clear message on where we stand and further solidfy our identity. It is personal, a conference statement cannot accomplish this. Hope your mom shares your next blog. I appreciate the feedback! Great points. Solid write-up Nixon, I certainly share some similar opinions about this. Mike, here’s one more of your fans: I’m joining in without joining in. I.e., I write to suggest that there may be reasons for an authentic and significant community entity [e.g., a church] NOT always making statements about issues that become the focus of public conversation. There is enough reason to preach and live biblical and moral truths whether political and social activists and other reformers care about them or not, whether they generally support or bitterly oppose them, whether they clearly articulate or absurdly caricature them. Again, there is significant danger in the reasoning that because everybody is talking about something, I or you or we also need to. Given your admirable, critical focus—on identity—I remind that the successful rabble rouser, or the brilliantly communicative deviant, or the devil, or the media, or the guy with the megaphone, or the attention-getting streaker or some other individual or group beyond those seven will set your agenda for you if you don’t know who you are and therefore what you stand for and therefore how you discharge your stewardship. Stewardship that must answer to every ringing of the town square bell is uncomfortably akin to reactionary, knee jerk behavior. The next fad, the next trend, and the next rebellion will all redefine it, and, perhaps, all three at once! Neither change nor whim nor impulsivity is of the essence of integrity. And it is possible to be thoroughly valid and relevant without standing on a soapbox. There is a time for speech. But there is, equally, a time for silence. Advocacy for balance allows respect for both. I have spoken. Now . . . .
Dr. Caesar, Thank you so much for blessing this space with your powerful insight. You raise some very poignant and important points. I do agree with you in the sense that the church, as an institution, is not called to speak out on every single “hot-button” topic or issue. We have to be careful not to act as a political entity in any way, shape, or form. I would submit that, as you mentioned, that successful rabble rouser/brilliantly communicative deviant can and will “set your agenda” for you not only if you don’t know where you stand, but also if you refuse to communicate where you stand. I think that as you said, there needs to be a balance, and perhaps my approach comes off as an over-correction because – as I personally see things now – we as an institution (and trickling on down the line to most local churches) are not engaged and vocal on some of these critical issues. We obviously have to be very careful, and choose our time to speak wisely….but taking an overall vow of silence in regards to any and every social/political issue is not something that I personally can support. Thanks again for your input and insight and blessings on you Doc! Thoughtful blog. Good for a soul searching of the SDA establishment. A crossroad of sorts for the dear doctor! Hoping from gifted hands to shattered gifts comes some kind of gifted recovery. Thank you so much for your insight/input. I too hope that he comes to his senses and remembers where it is he came from and re-commits himself to helping young people overcome the obstacles he overcame. Thanks again! Hope all is well. Interesting thoughts son. Let me suggest a few things. Dr. Carson could have done something rather unique with his candidacy and decided to be a truly non-traditional candidate. One that chose to affiliate himself with no particular political party. To be a Joseph, an Esther, a Daniel, political figures who transcended political ideologies and partisan pigeon holes. But instead he followed the footsteps of Jesse Jackson and Al Sharpton and became the the ultra-canservative version of them, without, it seems their common sense and political suave. With his comment about a person going into prison straight and coming out gay as evidence that homosexuality is a choice, he has even alienated himself from some Conservative Republicans. Having the title “Dr.” in front of your name does not insulate yourself from being “stupid,” and give you the license to say the first thing that comes to your mind. It is obvious that his candidacy is destined to be a blip on the radar screen of the political spectrum; perhaps a Jeopardy question 5 or 10 years from now that will stump some unsuspecting egg-head contestant to answer. The larger issue IS how our church has chosen to handle his candidacy. Thus far it has no strategy, which means , Dr. Carson WILL become the voice of the Seventh-day Adventist Church. I was in a meeting recently and it was told to us that if someone asks any of us a question or if we were asked to make a comment about Dr. Carson’s candidacy on behalf of the SDA Church that our response is to refer them the to the North American Division Office of Communications. That’s our strategy? That’s how the church intends to handle the candidacy of Dr. Carson? So when over one million Seventh-day Adventist in North America are asked any question about Dr. Carson and what our church thanks about it, our response is to refer them to the North American Division? With all do respect to my dear friend and colleague Lael Caesar who I respect and revere, that is absurd. Invariably Dr. Carson is going to comment on a range of issues. Issues that represent the political and social hot-button topics of our day that encompass the foreign and domestic agenda of a presidential campaign. They are not mysterious or hidden. If you can’t figure them out, turn on your television this Sunday and watch Fox News Sunday, This Week, Meet The Press, Face the Nation, CNN or John Stewart, whoever floats your boat. Dr. Carson is going to have an answer for those topics and inevitably someone is going to ask someone, anyone from our church, is his answer to that question, whatever it may be, the position of the Seventh-day Adventist Church? When someone has to answer that question, what are they going to say? Please refer that question to the North American Division? How will THAT make the church look, if over one million SDA members are made to look like “Stepford” Clones who can’t think or speak for themselves. The Church should have answers for these questions in advance. They are not mysterious questions. Questions on the economy, taxes, health care, foreign policy, Isis, Israel, The Pacific Rim, etc. We should have well thought out, well reasoned, Christ-centered, Biblically based, Prophetically driven answers that reflect our understanding of where American stands in the prophetic time clock of earth’s history. Do we really believe that Jesus is soon to return? Do we really believe in the Three Angels Messages? If we spent half the time preparing to answer questions like this instead strategizing for the General Conference perhaps we would be prepared to address the candidacy of Ben Carson. But his candidacy has come at an ill-advised time for us. Why couldn’t he have waited until 2020? Right now the Religious right has been preaching about some foreboding that they are associating to the April 15, 2015 lunar eclipse of the moon when it appeared red. John Hagee and other Evangelicals are preaching their prophetic messages and interpretations associated with these natural phenomenon while the Seventh-day Adventist Church, the Remnant Church of Bible Prophecy, remains silent with no voice and no message at a time of crisis and challenge. Yes we should and must have some answers to these question and if we don’t Dr. Carson WILL be the voice of the church. He WILL speak and represent us and it will be by default for lack of a policy or a position. All I can say is WOW dad. Thank you so much for your well-thought out and spot on response. What stuck out to me the most is the church’s troubling position is referring people to the NAD….it makes us look weak. What are we running from? It’s time to step it up, God requires more from us at such a time as this. Excellent! Well written article, bruh…..I am a former SDA ( I was once married to one). Not that that is important. 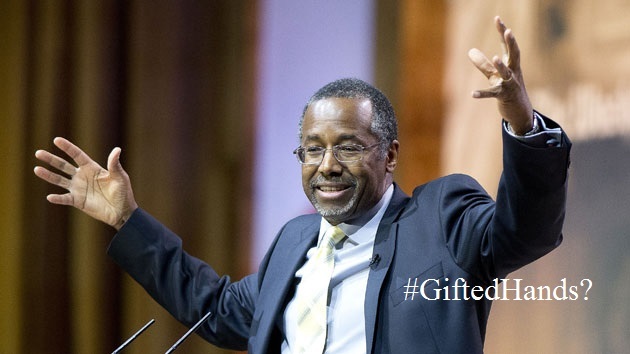 What is important is that I share the admiration that many had for the “former” Ben Carson. I don’t even recognize the individual he has become. Not only did I make sure that my own children read, “Gifted Hands”, I have personally gifted copies to numerous teenagers over the years. You have intelligently addressed important points, not only for SDA’s, but points that the larger African American Christian community have been confused about concerning Dr. Carson. And now that he has publicly endorsed Donald Trump, it confirms my belief that there might be something neurologically wrong with Carson, and I am not trying to be humorous, here. To the contrary, this is frightening. Next Next post: Is Skin That Deep?